Master players of the 1982 arcade classic Robotron will race to 100 million points today, hoping to double the current record of 50 million points. Already underway at MAGFest, a four-day music and gaming festival, is a chance to break the world record top score for a classic arcade game pitting humans against machines. The top score for shoot 'em up game Robotron 2084 currently sits at 50 million points. Few believe the record can be broken, but Robotron enthusiasts are in the middle of a race to 100 million points. 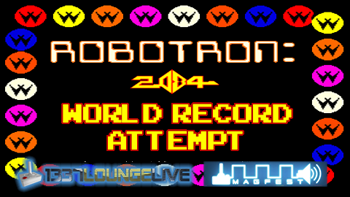 Participating in the 100 Million Gauntlet Challenge are players from the Robotron 2084 Guidebook and Williams Players Unite communities, including master players such as Dane Tullock, Ken House, and Jacob Golson. House currently holds the record for 50 million points. In the challenge, players have only one credit to make an attempt to break the world record. No restarts are allowed. In the early 1980s, cumulative scoring was allowed from multiple restarted games, as per Twin Galaxies' Walter Day's international scoreboard. Current rules allow only one go at the 100 Million Gauntlet Challenge. Walter endorses the challenge this weekend, which will be run as a 24-hour marathon streamed on 1337 Lounge Live where viewers can also join in on Skype videochats. Will history be made today? Participants have one credit with no restarts until 10 a.m. EST tomorrow to set a new world record.